ROCHESTER, N.Y. – Semrock, Inc., announces an important addition to its BrightLine® optical filters for multiphoton biological imaging with a unique filter optimized for Second Harmonic Generation (SHG) microscopy. 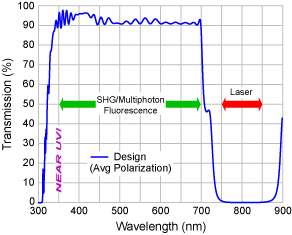 This state-of-the-art short-wave-pass dichroic beamsplitter is ideal for SHG imaging as well as multiphoton fluorescence imaging using a femtosecond near-infrared laser. The new high performance filter has extremely low group delay dispersion for minimized pulse broadening to allow deep sample penetration – a 100 fs laser pulse broadens by much less than 1% after reflection off the filter. And with its carefully controlled polarization dependence, it maintains a very high degree of linear polarization for both reflected laser light and transmitted signal light for all polarization orientations. "The ability to control polarization in Second Harmonic Generation imaging impacts an exciting new frontier in the study of thick tissue samples," said Dr. Turan Erdogan, CTO of Semrock. "This new dichroic beamsplitter allows the investigator to vary the polarization state of the laser while measuring a like-polarized signal beam for the utmost in signal-to-noise ratio. Our design team, responding to customer demand, overcame formidable obstacles in order to simultaneously provide high transmission over a wide bandwidth, with sharp transitions, low dispersion and excellent polarization control – properties not found in traditional dichroic beamsplitters." Semrock's multiphoton optical filters are in stock for quick delivery. And all of Semrock's filters are made with state-of-the-art Ion Beam Sputtering, for dense, hard dielectric optical coatings with high laser damage threshold, low temperature sensitivity, and permanent performance. Semrock offers an industry-leading five year warranty on all of its filter products. Visit www.semrock.com for more details. BrightLine and Semrock are registered trademarks of Semrock, Inc.